Dear participants, I would really be thankful if you could be clearer when claiming DJ entries of mixed dream types. Please list each dream separately to avoid confusion. Less confusion avoids wrong scoring for you. Congratulations to Eilatan for being the only one to bet on RCILD! Eilatan is enjoying a pair of successes without dividing the shared points. Congratulations to LucidWilliam for being the first to claim an RC-ND! ðŸš¤ Speedboat: See a speedboat running. ðŸŽª Circus: Get into a Circus. Eilatan I love the picture of the little soccer bots, they look/sound so cute in your dream! I was thinking of recreating the sculpture I saw in the forbidden room dream, but probably wonâ€™t get the time before the weekend. That will be too late to submit, right? ^ Just saw this. Thanks very much. Also, please recreate the sculpture anyway! It would be great to see! Note: This is not checkpoint, the previous checkpoint already covers all the claims. Does this count for the locomotive subtask, or do they have to be actually steam-powered? Yes, it must be steam powered. This is important since I might also add other types of trains as unlockables. Do not be sad, I like trains. 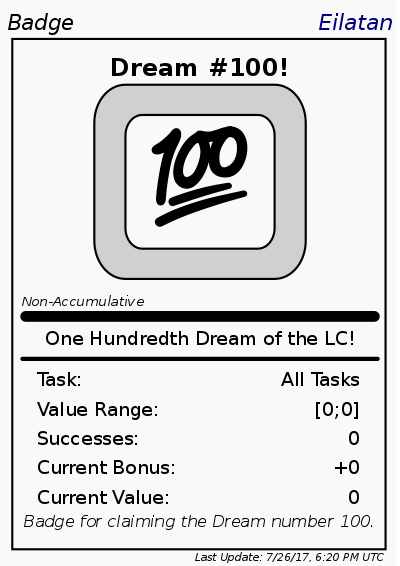 During the past 2 days we have reached 100 points and 100 dreams. Time for more pictures. Check your profile pages at http://lc60.keepdream.in ! Well, you did it! You saved the remote volcanic island from all kinds of deadly danger. And you even picked up trash to be nice! You're a real hero to them. "Thank you," an important-looking DC says to you, "we are forever grateful for your heroic acts. Please take this as a reward..." You're handed a big medal that says "YOU DID IT!" written in Comic Sans. Well, it's the thought that counts, not the typeface, right? As you put the ribbon on, you notice a helicopter landing on a nearby helipad. Some reporters and a camera crew get out and start walking towards you when they spot your shiny medal. "Are you the hero who saved this island?" a news woman asks you. You nod and she snaps her fingers. Some crew members come up to you and start dusting your face with makeup so you look "camera ready", and within a few seconds your suddenly being interviewed for the news! You describe your heroic acts in great detail, even showing some pictures you happened to draw for some reason, with the TV crew looking pretty impressed. After all, this makes for some great TV! Within minutes of the report airing on TV, you get contacted by some business executives. They want you to give a celebrity endorsement of their product. You're famous now! You accept the flood of deals coming your way. You make guest appearances on TV shows, get invited on radio shows, and even get to appear in a drag race commercial! In fact, that last commercial got you an even stranger offer: An invitation to participate in the "Annual Lucid Dreamer's Worldwide Race". The invitation comes from the event organizer, Bartholomew Notanaddict, who would be honored to have you participate. While you've never heard of this event before, clearly it seems like a valid offer that isn't in any way deceptive. You arrive at the meeting spot for the race participants, which is just some dark room with a bunch of chairs. You sit down with the other participants and notice they all seem familiar... you can't quite put your finger on it, but you know these people from somewhere. As soon as you realize what you recognize them from, you hear a familiar voice. "AHA! I finally found you all! I can't believe that actually worked!" Mew appears, visibly upset. "I can't believe you all ditched on me! But now, I finally got all of you Lucidity Challenge participants together!" Mew takes out a stack of documents and starts searching through them. "Now, where were we. I guess we're now in week two or so... so, that means this week's task is... well, let me first calculate the differential and..."
- Night after 20 July: one Short LD with some kind of event in a stoney landscape. - Night after 22 July: one Medium LD about philosophical discussions, cats and flying/steering aircraft. I remember being awake that morning and having lots of HH, so I'll treat this as a "mostly accidental" WILD (up to host for interpretation). Also heard a deep bellish pad soundtrack, I would recreate it if I still recalled it. No online DJ link. Claiming task: see aircraft. Mew151 is right! It's time to be quick during this week! This is Task 2. We are back to the competitiveness everyone enjoys in the LC, right? People are impressed by your abilities. This time you have been invited to break records. Can you reach incredibly high speeds? What happens when you break the speed of sound? You must go there and do it quickly! On your marks! Go to bed! Wait! Do not sleep yet, please read the rest of the plan. The first subtask is naturally to reach the scene where you are supposed to reach super high speeds. How is it going to be? It is your decision that counts! The most important subtask is to reach the scene where the high speeds are going to be measured! Where is it going to be? You decide! Perhaps it is your chance to create your own vehicle to complete this run. What would you build? Any type of vehicle. Be sure to tell us what is it while claiming. It must be your own creation. When you break the record, win or lose... It is time for some strong emotions. Can it bring you to tears? Sad or happy, reach a emotion strong enough to bring you to tears! May be unrelated to the task. Hear and see a sonic boom. What does happen when something large breaks the speed of sound? Whips and kung-fu fists are too small to count, sorry. You cannot do everything by yourself, be sure to meet your own team. Meet your team composed by at least 4 people. They must know you and be willing to cooperate. Does not need to be related to the task. In any dream, if you find something special, record a video! Record a video in your dream. If you can share the video in real life I would give even more special points! Also, Thank god I didn't do the first task. Those poor DCs would've had to face my wrath had they given me a medal on which the engraving is in comics sans..
Just a dream from this morning.. Nothing much else. Hello? What do you mean by that? Did you get an LD by SSILD? You have already claimed shares of the technique upon joining. Dear participants: We are during Week 1 tolerance. If you don't post the dream date, it is considered to be Week 2. 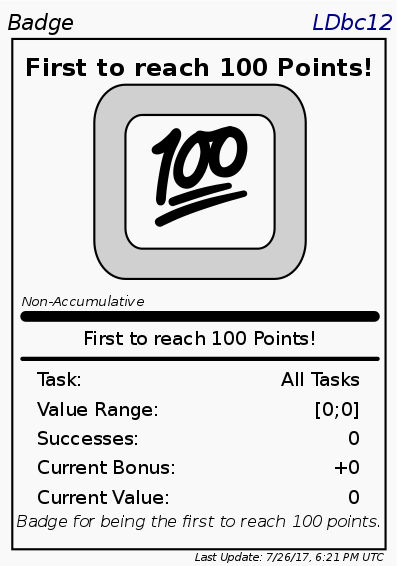 Techniques and Task 1 subtasks without attempts have increased in bonus by two! The tried ones are stuck with the same value. We will add one point to subtasks that were only tried once though, keeping the balancing efforts, so you still have motivation to try everything. Check in post updating tomorrow. Had an ND no tasks completed, but I plan on doing a dream art sketch for it. I'll follow up and post again when it's completed/updated. 1 ND, no tasks/subtasks done, DJ entry "Vegetarian"
remembered another ND, no tasks/subtasks, DJ entry "Cauliflower"
The DC says, "Your troubles are gone." I immediately feel all my worries, anxiety and stress leave me. A weight lifts from me. It feels great.